Emerging from the throes of the sacred Nothl Realm, Huskar opened his eyes to see the prodigal shadow priest Dazzle working a deep incantation over him. Against the ancient rites of the Dezun Order, Huskar's spirit had been saved from eternity, but like all who encounter the Nothl he found himself irrevocably changed. No longer at the mercy of a mortal body, his very lifeblood became a source of incredible power; every drop spilled was returned tenfold with a fierce, burning energy. However this newfound gift infuriated Huskar, for in his rescue from the Nothl, Dazzle had denied him a place among the gods. He had been denied his own holy sacrifice. In time the elders of the order sought to expand their influence and Huskar, they agreed, would be a formidable tool in their campaign. Yet becoming a mere weapon for the order that denied him his birthright only upset him further. As the first embers of war appeared on the horizon, he fled his ancestral home to find new allies, all the while seeking a cause worthy of unleashing the power his total sacrifice could bring. Huskar is a manly hero that never afraid of death. He will forging ahead undeterred. He will fight any man bravely. He never wants to give up. He should attack until die. To kill or to be killed is his destiny. This hero you should play with manly heart. You should attack all enemy without any fear. The closer to death, the more powerful he will become. So don't stop attacking. Don't run and you will be the only one who alive. Have a strong endurance. 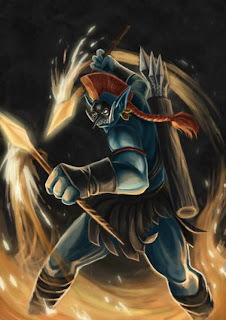 He is so tanky against magic Usually Huskar player become reckless and cast his ultimate for suicidal thing. His ultimate makes him can easily catch and kill his target. Unlocks the regenerative power of a friendly unit, with healing based upon its primary attribute. If the target is below 40% it will heal faster. Lasts 16 seconds. While Huskar has little use for magic, this minor enchantment was learned from the Dazzle and the Dezun priests, to be used in times of great injury. Regenerates HP based on primary attributes. If you are AGI hero, the regeneration is based on AGI stats. If you are an INT hero, the regeneration is based on your INT, or if you are a STR hero, the Regeneration is based on STR. This skill will regenerates faster if you are below 40% HP. This skill will be very useful in late game, where our primary attributes (STR, AGI, or INT) will reach it's maximim and can Regenerate HP quickly and no need to go back to base. This skill is similar to Heart of Tarrasque in terms of Regeneration. This skill can be use to substitute Healing Salve and can save gold. Huskar sets his spears aflame, dealing damage over time with his regular attack. Multiple attacks will stack additional damage. Each attack drains some of Huskar's health. Lasts 7 seconds. Burning Spears is a Unique Attack Modifier, and does not stack with other Unique Attack Modifiers. The Sacred Warrior ignites his weaponry after marking it with his own blood - causing far greater pain than he himself feels. Deals some damage per second. 16 damage per second for 7 seconds is actually a decent damage in mid game, and can kill enemy rather easily. Very good to harass enemy. This skill will kill the target if the target is in low HP and try to run. There are 2 types of Huskar, 1 Lifesteal, 2. Burning Spear Type. If you choose lifesteal type, don't increase this skill. This skill is for Burning Type Huskar. The weakness of this skill compared to lifesteal Huskar is that this skill cannot Regenerate itself with each attack like lifesteal. And because your Ultimate will reduce your HP for like 50%, then you will fight your HP below 50% and that's very risky without lifesteal. Inner Vitality can helps you to survive, so cast Inner Vitality befor fighting. 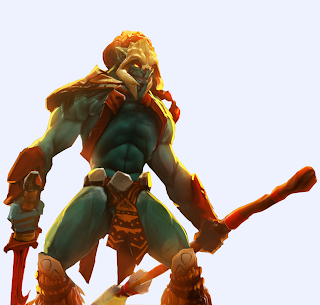 Huskar's injuries feed his power, giving increased attack speed and damage for each 7% of missing health. After losing his birthright, Huskar gained a lethality in physical combat that is only heightened as his own blood is spilled. Gives more attack speed and magic resistance the less HP you have. Very much match with your ultimate Lifebreak which will reduce your own HP so you can boost your attack speed. Huskar should not run from every fight. He must, brave and keep attacking enemies in front of him until he dies himself. Lifesteal will keep you alive in very low HP. With lifesteal you can keep your HP in a bad condition and keep fighting. No matter the danger, Huskar thrusts himself into melees that only he can survive. Huskar will deal 50% HP damage to single targetted opponent, and slow down the target. Very nice skill to kill enemy. With the enemy's HP become 50% and slowed. You can easily attack him until death. There is difficult to run away from Huskar after receiving this skill. Very good to chase enemy or to initiate a teamfight. You can combo this skill with Necrolyte's ultimate that will deal damage from 50% HP until death. But Necrolyte is also dangerous if he act as the enemy. He will kill you with his ultimate after you use your ultimate that reduce your HP. You can take 1 level of Inner Vitality in early game to helps you survive in early-mid game. In early game you need to lasthit as many creeps as you can. Burning Spear, you can use it to lasthits creeps or harass enemies. If there is weak hero want to trade blows with you, just accept it, and you can kill him. If you are a lifesteal type, you should get helm of the dominator as fast as possible and use it to survive after you use your ultimate. Mid game is the time for you to start hunting and getting some kills. Huskar can solo kill enemy hero because of his ability to LifeBreak the enemy. You need to come from the jungle and then use your ultimate to the enemy and then attack until death. If there are two enemies and not so close in range, you can kill 1 enemy, but be careful, they still can fight you back. It is better to fight if your number is even or bigger. Your part in the game is a carry. You should maxed your damage per second by this time. In a teamfight, you can initiate a teamfight using Lifebreak, and then you can use Blademail or Bkb to defend yourself. You should kill your first target before changing target. Don't afraid of low HP, keep your brave heart, keep fighting, until you got RAMPAGE. You should be the one to initiate a teamfight. Jump using Lifebreak and kills enemies one by one. This item will literally makes you a monster on early game. With additional strength, health and damage, you should be able to manfight anyone. You can skip power thread and rushing this item leaving brown boots in your inventory. So the most important thing to know for armlet buyer is to know when and how to toggle this item properly. you, that way the next projectile hits you when you already gained the additional of 500 health. 3. Helm of the Dominator and upgrade it into Satanic Later. Active: Dominate - Take control of a non-hero, non-ancient target unit. Passive: Lifesteal - Gives lifesteal on attacks. This items gives you +Damage and the most important: lifesteal. With a lifesteal you can survive in a tough teamfight. This item also gives you the ability to dominate creeps, I recommend you to dominate Alpha Wolf to increase your damage. Why Black King Bar? It gives you survivability in a teamfight because you will get magic immunity during teamfight. APassive: Critical Strike - Grants a chance to deal critical damage on an attack. With this, you become a true moster. This is because you have a very high damage and this item will multiply your damage so everyone can't match you anymore. You also can buy MKB, its up to you, both MKB and Daedlus is so good. Passive: Health Regeneration - Restores a percentage of max health per second. This ability is disabled if damage is taken from an enemy Hero or Roshan within the last 4 seconds if your hero is melee or 6 seconds if your hero is ranged. Why Heart of Tarrasque? Makes you tanky. So good item for an initiator like you. He has Shallow Grave, a skill to protects you from death for 5 seconds, a very good skill to cast on Huskar who is low HP. You will deal lots of damage with high attack speed and not afraid of death. He also have an AoE heal to helps you survive in teamfights. He has a very good combo with you. Both of your ultimate is very suitable. First, you should use your ultimate on a targetted hero, then he should use his ultimate right after you. Your ultimate will deal damage from full HP to half HP, and his ultimate will deal the rest of enemy's life. 2 shot death to single targetted hero,so powerful. Although he will be a good friend for you because of your ultimate is perfect match with him. His ultimate can also kill you if you are his enemy. Your ultimate is a double edged sword which deal damage to yourself, with the low HP, his ultimate can instantly kill you, so be careful of him if he is your enemy. every man woman or child will be faced with the issue of dota2 guides. Remarkably dota2 guides is heralded by shopkeepers and investment bankers alike, leading many to state that its influence on western cinema has not been given proper recognition. The juxtapositioning of dota2 guides with fundamental economic, social and political strategic conflict draws criticism from the easily lead, who form the last great hope for our civilization. At the heart of the subject are a number of key factors. I plan to examine each of these factors in detail and asses their importance.